Hungarian goulash is one of that country’s best-known and loved dishes and one we generally think of as a stew, but originally goulash was closer to a soup than a stew and this Goulash Soup Recipe version reflects those origins. 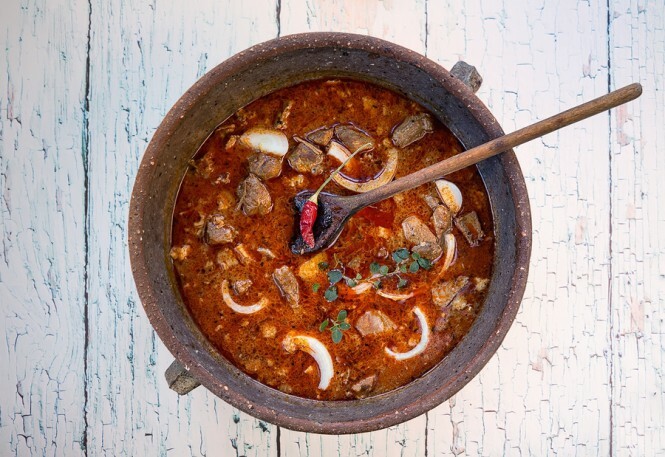 Stew meets soup in this rich Goulash Soup full of the flavors of Hungary. Looking for the perfect pot to cook up your next batch of soup? I recommend the Lodge Enameled Cast Iron Dutch Oven. It comes in 11 different colors and is an excellent value for the price. French-Canadian Habitant Pea Soup Recipe 2019 – Savory Is a Must! Todd on What is the Best Chili Seasoning Packet Mix? Karyl Griffin on What is the Best Chili Seasoning Packet Mix? Jennifer Mendez on What is the Best Chili Seasoning Packet Mix? Noni on What is the Best Chili Seasoning Packet Mix? Robert Geraci on What is the Best Chili Seasoning Packet Mix?